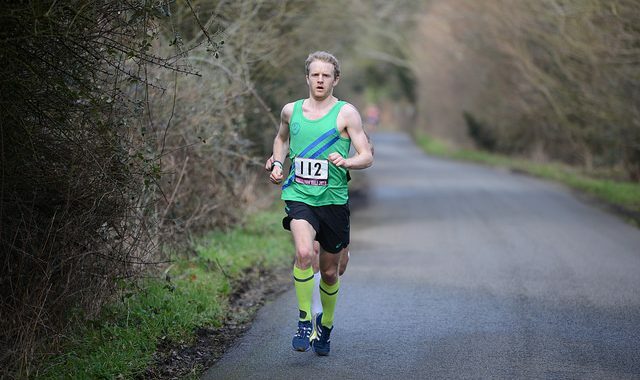 ROB CORNEY broke the 23-year-old Reading Roadrunners club half-marathon record with a sensational second-place finish at Wokingham on Sunday. Corney trimmed four seconds off Howard Grubb’s record with his time of 69 minutes and 20 seconds. He was only beaten by the Great Britain Olympic marathon star Scott Overall (65:11). Rob was always in the front group of the best of the rest and chased down the former Reading AC runner Johnny Roberts in the last three miles. “I noticed Johnny was tiring,” he said. “So I started to reel him in. I got into second with about one mile to go and then just had to grit my teeth and maintain the pace to the line. His Roadrunners team-mate Matt Richards was our second man over the line in eighth place in a time of 71.01. Rob was one of three Roadrunners to win a Berkshire county athletics championships gold medal at the event, along with Alex Harris and Alan Freer. And there were silver medals for four of our ladies – Gemma Buley (below), Erica Key, Mary Janssen and Lesley Whiley – as well as your author. Those awards were the icing on the cake for the club after another hugely enjoyable and successful Wokingham event which, sadly, I understand may be the last. Rumour has it that several of the committee are considering standing down after many years of service and replacements are hard to find. That’s a shame because Wokingham has a reputation for being the local ‘half’ with the noisest, most supportive marshals and fans. If Overall is the final winner of the event, it is a pity his tweet “Solo run at Wokingham today” sounded a bit sniffy and dismissive. It is six years since the 35-year-old Londoner ran 61 minutes in New York and, if he doesn’t like running solo, he should drop back through the field where he can find some excellent company among those of us grinding it out in the middle of the pack. He would be privileged to run alongside people like my old training partner Melanie Shaw who, after a year out injured and over two years since her last ‘half’, was well pleased to finish in 1:42. Or he could have run with fire fighter Vince Williams, who came straight to the race after being on duty all night (last call 5.30am) and still managed to turn in a 1:40. And he could have teamed up with one of Chris and Gemma Buley, a really nice couple who are fast becoming the top husband-and-wife team in Reading Roadrunners. The Buleys are slaughtering their pbs every weekend these days, starting with ‘his & hers’ pbs on consecutive weekends at Woodley and then Reading parkruns. 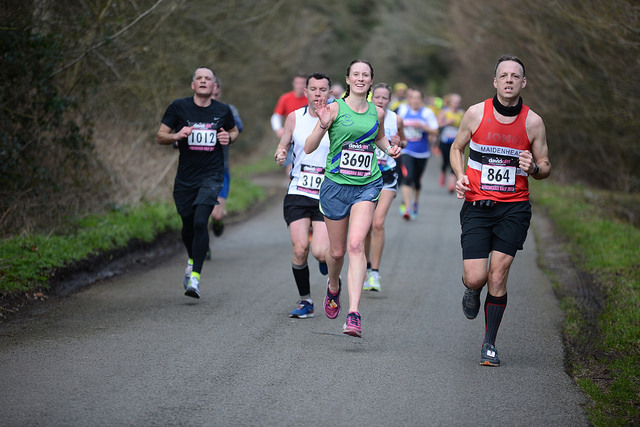 At Bramley, Gemma (right) knocked 10 minutes off her best while Chris professed himself disappointed with a time of 2:31 for his first 20-miler. 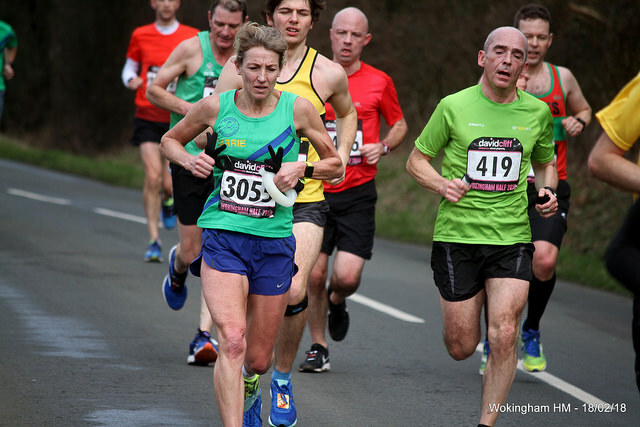 At Wokingham, both ran 10-mile pbs on their way to new marks at the 13.1 distance, Chris improving by six minutes and Gemma by four. 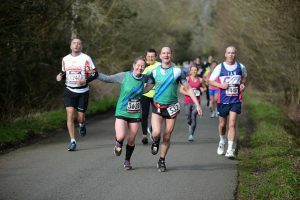 Gemma, of course, has a top running pedigree, being the great-niece of the former world cross-country champion Stan Eldon, but Chris only took up running late in life when he got fed up waiting around for his other half to finish ultra-marathons. The secret of success for the two teachers seems to have been their decision to train together outside of any Wednesday evening groups at Palmer Park. “The biggest difference for us has been putting in the hard work together,” said Gemma. “Training at track with just the two of us has meant that we can plan sessions that work for us. Competition to the Buleys for the honour of top family at Wokingham came from the usual suspects, Caroline and Sophie Hoskins. 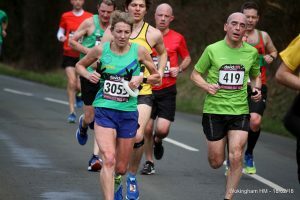 While the new England call-up Caroline was the Roadrunners’ first lady home in a new pb time of 1:24.17, daughter Sophie tasted success for the third successive weekend, with a half-marathon pb to follow pbs at 10k at Chichester and 20 miles at Bramley. Going even one better than that was the PB Queen, Helen Dixon, who made it three in the space of eight days, with Wokingham following new marks at the Bramley 10 and Woodley parkrun. 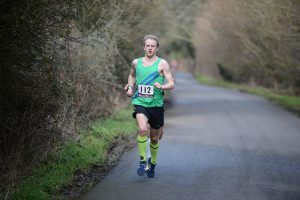 The pb roll of honour from Wokingham, led of course by Corney, the Buleys and the Hoskinses, included a 12-minute improvement by Grant Hopkins down to 1:24, ten minutes off by Beth Rudd, six by Sarah Walters and five by Stewart Wing. Our senior men’s club champion, Justin Simons, pulled off a great double, following up his 1:29.06 pb at Wokingham with a course record in a swimming-and-5k run duathlon at the Oratory School straight afterwards. Other Roadrunners to make it a pb double at both Bramley and Wokingham were Katherine Sargeant and Tony Streams, as well as Paloma Crayford and Maria Norville. Also setting new marks were Dan Brock, Sarah Richmond-De’voy, Erica Key, Ian McGuinness, Susan Knight, Tony Long, Gareth Goodall, Holly Towers (right), Katie Gash, Gary Clarke, Veronika Royle and yet another of Katie Gumbrell’s quickly improving group, Diane Hodder. It surely can’t be a coincidence that a good percentage of these people were among the very few braving the deluge on the track last Wednesday night. And one of the last runners to finish their training despite the Noah’s Ark conditions… Caroline Hoskins. End result of her efforts… an age grading of 87.98 per cent. There are no short cuts on the way to the top. While the award for runner of the day on Sunday undoubtedly went to Rob Corney, the award for coach of the day went to…. Rob Corney! Rob has been coaching my son, Mark, who achieved the astonishing improvement of FOURTEEN minutes from 1:39 down to 1:25.35. Mark (left, chasing down Caroline Hoskins) is a veteran of the Sweatshop Running Community set-up and has made huge strides since he started training regularly with the club wonder-boy. So that’s the secret! All you have to do is train with Rob Corney! Just try it for five minutes and see how it goes….